Let's Do It for ME! : Great Start to 2015! Wow, thanks to everyone supporting, what a busy start to the new year, hard to believe that January's over so soon! This is a landmark year, as 2015 marks the 10th year of Invest in ME charity and the 10th of their renowned international biomedical research conferences (IIMEC10). You can read more in the first Invest in ME newsletter of 2015, published in pdf on 27th January - http://bit.ly/1wAnt7L You can sign up to receive their free e-newsletters by email. Jam-packed as usual with news of their amazing work on campaigning, advocacy, education, and with updates on the research and fundraising on pages 8 and 9 of the pdf. You'll see links to some of the new fundraising events organised so far for 2015 including: Walk for ME, Twighlight Colourthon, Brighton Half-Marathon, Sheffield Half-Marathon, Brighton Half-Marathon, Thames Path Challenge, Tough Mudder South-West, 2015 miles of running in 2015, A Birthday Challenge. You're welcome to let us know if you're planning any events for Invest in ME, or if you'd like to help out in any way with our awareness and fundraising in support of the charity. We are mostly severely ill and the charity itself is also run by volunteer patients or parents/carers, with no paid staff. Gut Microbiota Research - £130k raised of £200k target. Rituximab Research - £368k of £450k target. So, just £2k shy of a whopping £500,000 raised for Invest in ME Biomedical ME Research Funds since our campaign launched in July 2011 support of the charity's proposal (published May 2010) for a centre of excellence for translational biomedical ME research and patient care! Oh, is 1st of the month? 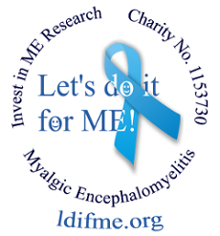 The day to donate just £1 to IIME's 1st class biomedical ME research! Let's Do It for ME is a patient-driven campaign helping to raise awareness of the work of independent UK charity Invest in ME (Research) on developing a UK centre of excellence for M.E. and funds for the biomedical research into myalgic encephalomyelitis that the charity is organising and/or funding. Invest in ME is run entirely by unpaid volunteers who either have ME or are parents and carers of ME patients. They are driving the agenda of scientific biomedical research into diagnostic tests and treatments for myalgic encephomyelitis in UK in collaboration with international researchers of world renown. 2015 marks the 10th year of amazing progress made by this small charity with a BIG cause. Will you help them make it the best yet? Let's do it for Invest in ME!